You know how last week, I was all, like, find zucchini at all costs to make this cake and never use zucchini for another thing and blah, blah, blah? Yeah, well, forget those words ever came out of my mouth. Because you are going to need some zucchini for this soup and I promise it’s going to be lifechanging. I swear I’m not even trying to be dramatic. This soup is shockingly delicious. It’s creamy with a thick, velvety texture that tastes like you are eating the most decadent soup in the universe. Except there isn’t any heavy cream (or dairy) in sight. Ready for the lifechanging part? Zucchini makes up the luscious base of the soup. Zucchini! I know…get out! Zucchini is simmered in a garlic-leek broth and then blended to smithereens making a creamy base for the spinach and chicken (which by the way, I’ve left out the chicken completely a time or two making a great vegetarian meal). It has left me laying awake at night wondering how I can use zucchini as a “cream” substitute elsewhere in my life. Not only is it creamy and delicious, it manages to be one of the most healthful, loaded-with-veggie soups I’ve ever put in front of my family. And additionally (I know, can you believe there’s more? ), while I was a bit skeptical how it would be received, I mean it IS bright green for goodness’ sake, my kids ate so many helpings that there wasn’t any left when Brian got home late from work. I mean, who am I to say to my kids, “No sweetie, you need to stop eating a lifetime’s worth of spinach and zucchini now.” They were freaking out (in a good way) about the crazy green soup they were eating, positive it was giving them instant super-hero powers. I’m pretty sure they renamed the soup “Hulk Soup.” And don’t worry, I’ve made it three times since so Brian’s been able to get his fill and flex his own muscles, too. I usually serve this with some homemade bread and butter. Or grilled cheese. Or saltine crackers. And some fruit. Nothing fancy but seriously, it’s amazing. My friend, Liz is the lovey who sent the recipe to me. She and I were inseparable best friends in our youth. Like, wearing matching outfits and making up choreographed routines to Michael Jackson songs. And I’m not even going to admit how long we played with our massive amounts of Barbies and accessories. Friends like that? Well, you totally trust the recipes they send you. And this one has landed into one of my favorite soups of all time. Get your hands on some zucchini and make it. Plan ahead since the recipe calls for cooked chicken - or just leave it out (like I've done a time or two - makes a delicious, vegetarian dish). Recipe Source: adapted from my childhood best friend, Liz P.
I’ve made this often and I love it. Even my husband who turns his nose up if I put veggies on his plate likes this soup. I do add chicken and then I like to add some Parmesan cheese on top. Thanks as always for the wonderful recipes. I just made this soup! I followed it to a tee, and it came out perfectly. The soup was not as spinachy-tasting as I had imagined, but it is amazing how tasty it is with the blended flavors of garlic-leek-zucchini-spinach! For the topping, I drizzled a little walnut oil over the soup. This is perfect for any souping cleanse. This is my favorite soup! But now I love it even more! My almost two year old has always been a great eater and will eat everything but she has slowly been turning into a “toddler eater” and won’t really eat veggies (she used to eat veggie soup for breakfast if she knew I had it!). I was thrilled today when she tried it and then ate three servings! I can’t wait to try this! Would it be possible to use an immersion blender right inside the pot instead of transferring it to a separate blender? 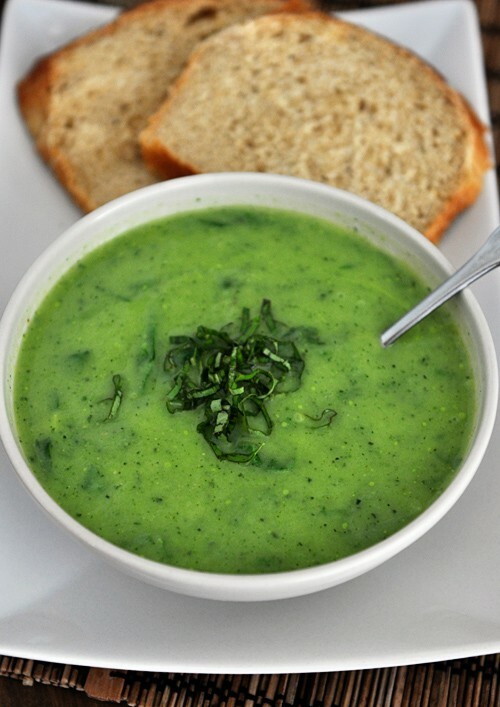 Can I freeze the No-Cream Creamy Basil Spinach Soup? Onions vs leeks…any difference? Yes, you can freeze the soup! Leeks have a more subtle flavor than onions. I just made this soup and LOVE it!! 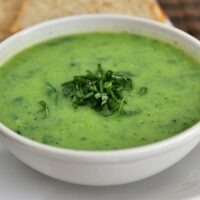 The only thing I did differently was to add the spinach to the blender with the zucchini and leek mixture to create a completely blended soup. I disagree with this being 4 servings as I pretty much inhaled 2 bowls at lunch. Ridiculously easy to make and is so clean tasting and yummy! I love this soup and have made it for years. Any thoughts on how to make it in the instant pot? I haven’t tried it yet, but I’d saute in the Instant Pot, add the broth and then cook on high pressure for 1-2 minutes, maybe? I’m not sure the IP will save much time here with the coming to pressure and all that, but it’s worth a try! You are right about the time thing. I’m just looking for a way to get dinner mostly made while we’re at piano lessons! I did what you suggested and then just had to come home and add spinach and basil, then purée. Worked great! Thanks! Glad it worked out! And I hear you on just needing a hands off approach. Instant Pot to the rescue! I love my Instant Pot, but I would advise against making this soup in a pressure cooking. The beauty of a soup like this is its freshness which is easily dulled by any setting other than saute. Hi. Has anyone done a nutrient breakdown of this recipe? Calories and sodium in particular. I’d love to try this based on the reviews but am on a low sodium diet. Thanks! Have you tried freezing? Making this for a yoga retreat and ended up with extras! Let’s see if my enormous batch gets eaten 🙂 super yummy soup. Thank you!! I haven’t – sorry! I’m guessing it will freeze great, though. I am 7 years old and I give this soup 5 stars. It is super good. I like the taste the basil gives it an d also, it might look bad, but it is super good. Thanks for the review, Xavier! Love this recipe. Great nutritous, filling and low calorie lunch after a workout. I dollop some non-fat Greek yogurt on top for added richness and a little protein. Totally guilt free and easy to make with an emersion blender. Also use a combination of spinach and kale. This soup is amazing!!! My husband can’t eat too much dairy so it’s perfect for him 🙂 We’ll be making it again but this time, we’re definitely going to double the recipe because it didn’t last long! This is delicious. I doubled the recipe and carmelized 3 full onions to use in this soup. I threw the batch with Spinach into blender for second time with remaining stock and soup turns out creamier. 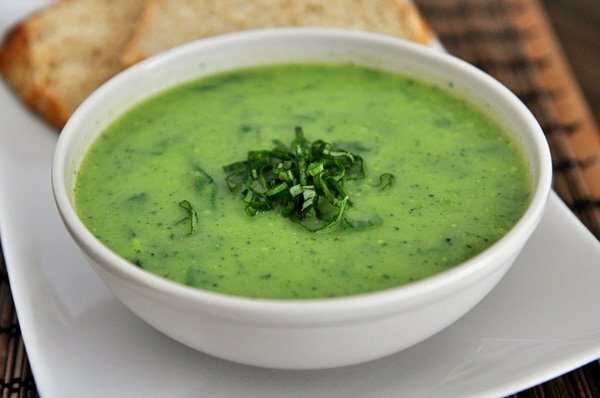 Thank you for the “No-Cream Creamy Basil Spinach Soup” recipe. I have allergies to dairy and gluten, and was looking for a new and unique way to cook the zucchini in my fridge. This recipe looked interesting, but I was a bit skeptical that it would taste as good as the photo appeared. However, I have to say it far surpassed my expectations and I found it to be amazing! I believe the simplicity of seasonings is part of the reason I enjoyed it. My husband took a look at all the green and was certain he would not like it, but his mind changed at the first spoonful and he is looking forward to the next time I serve it! Really satisfying, flavourful and creamy ! I can’t believe it had no milk, cream or potatoes ! Made it today for my mom and sister they love it very tasty and delicious. I will make this again. Would frozen spinach work? I know I’d have to wring out the water very well. Also, what would you sub for leeks – scallions or sweet onion? Love your blog – it’s the best! I just made this soup last night and it is amazing! I left out the chicken, used vegetable broth, and decided to blend the spinach at the end as well. I wish I had doubled or tripled the recipe though! I too, will now be wondering how else to use zucchini in lieu of cream! This was the best, and healthiest, soup I’ve ever made/had in my life! I felt like a complete rockstar serving it to my husband and his friends! They all loved it!!!! Thanks for your notes on this recipe, Andrea! Made this soup yesterday for a potluck with some dear friends who are much older in age than we are. Their cooking is amazing, but they were raving about this soup. We all loved the flavor profile it has. thank you for all your recipes. Still have not made one from your site that hasn’t been knock off. Thanks again! I love this soup but do a double recipe, use full sodium broth and add one can full fat coconut milk to give it more body. Thank you for this recipe! It is a regular in my house now. Healthy and deliciously creamy. This looks AMAZING! Think it would work to replace the spinach with kale? I’ve got kale coming out my ears right now! Sometimes leeks can be sandy.. soo alot of rinsing I have found. leek do you use in the soup? I only use the white part of the leeks. loved this soup!! I did not use the basil though. My daughter is a fussy eater but I was able to get her her drink a whole bowl. I like this soup. It’s good hot or chilled. Great soup – thank you for the recipe! I’ve made this the a few times and my husband (who’s not a big veggies fan) always devours it. The leftovers were great for work lunches (sometimes even a quick, hot breakfast! ), too. The last time I made it, I ended up substituting about 1 1/4 cups of coconut milk, though, for some of the chicken broth (I probably added about 2.5 cups of liquid total instead of the 2 cups of chicken broth) since I didn’t have enough broth. The coconut milk just made it creamier, while still keeping it dairy-free. found this recipe on Pinterest today and had to immediately make it. Soooo glad I did! Super easy to make and it’s absolutely delicious! My husband and baby devoured it. Can’t wait to make a big batch soon so I can freeze it. Thanks for sharing the recipe! I made this for the 4th or 5th time last night. So yummy! My whole family loves it, including my 2 year old daughter. I blend with an immersion blender after adding the spinach – my daughter gets weirded out when there are spinach leaves floating in the soup. I’ve shared this recipe with my Weight Watchers group as well. We’re all big fans!! I’ve also had success using dried basil when I couldn’t find fresh basil at the store. I never comment on anything, but this soup is too good not to thank you for. I’m working on my second gigantic pot of it right now. Thank you! Hi Mel! I consider myself a novice cook (I’m 52!) since it’s not something I’ve ever enjoyed doing (Baking is a different story!). I think you are slowly but surely changing my mind about cooking! So, on to this recipe…..we’re having a soup day at work (something like a potluck) and I’m going to give this a whirl (my family won’t eat green, so my coworkers are my test subjects!). Any ideas on how much I’d need to increase for a crock pot? Quadruple it? I’m not great at judging amounts and I don’t want to come up short. How many days ahead can I make it? Hi Desiree – so glad you are enjoying cooking! This soup doesn’t make a huge batch – if you want to fill up an average crockpot (a round 4- or 5- quart one), I’d say you probably need to at least quadruple it, maybe even more than that. You could make this 2-3 days in advance and reheat the day of. Hi Mel. Thanks for this. I ended up making 4 batches. Also ended up with leftovers, but just froze individual servings for later. Everyone (and I mean everyone!) loved this soup! I’ve been singing your praises all over Winnipeg (Manitoba) and I know there are a whole bunch of “Turn to Mel’s Kitchen” converts out there! Thank you, Desiree! Winnipeg is near and dear to my heart (we just recently moved from a small town in Northern Minnesota and I drove to Winnipeg all the time to do my shopping!). Have made this soup 4 times in the last couple weeks…and I’ve DOUBLED it the last 3 times. I keep it all to myself and eat it every day for lunch. It’s delicious. Love it! This soup looked delicious, so I tried it. I was surprised at how spicy it is! Did I do something wrong, Mel? Has anyone else had that problem? My family prefers less spicy foods except for my son who liked this soup. Do your kids like spicy food, Mel? I might put a warning in the recipe about it. I will make it again, but cut the spice amounts in half. I think I’ll really like it then. I’ve never cooked with leeks before, so that was interesting. Thank you for all your great recipes and for your enthusiasm for cooking. Hi Dawn – sorry this soup turned out spicy for you. That surprises me a bit since it isn’t spicy at all when I make it (my kids are ok with a little bit of heat, though). The only ingredient that could be contributing to the spice is the black pepper so perhaps cutting back on that will help (I’ve never heard of leeks being spicy but I guess I could be wrong about that). Hope you like it better if you try it again! Just wanted to let you know that this recipe filled the “what my mom makes best” slot on my 9 year old daughter’s Mother’s Day questionnaire. Pretty special! Could I make this and have it turn out fine without the leaks? Would the cream still turn out? Thanks! Meghan – I’d probably sub some other type of onion for the leeks for flavor. This soup is INCREDIBLE!! We are addicted! It’s so fulfilling to make, and then eat, something that you know has ZERO unhealthy or questionable ingredients! This is pure genius. Thanks so very much. I made this today and it was DELICIOUS! I think next time I will sub veg broth and beans for the chicken broth and chicken to make it plant based and see how it turns out. I think it would be delicious (not plant based obviously) with crispy bacon instead of the chicken. It definitely needs to be doubled. Thanks for sharing! OMG! So good, and if you leave out the chicken, it’s only 3 points for the whole pot on Weight Watchers! Loved it! PS This soup really is life-changing! We make it all the time and it’s amazing! Thanks, Jen – your comment made my day! I made this for dinner last night and am IN LOVE WITH THIS SOUP! SO much that I tried sharing it on my facebook wall (via the facebook icon you have with this recipe) but it wouldn’t work 🙁 Thanks for such an AMAZING recipe, Mel!! I simply cannot believe how good this is. I’m passing it around to everyone I know. I’m lazy, though, so I just tossed some basil leaves and handfuls of spinach in with the mixture in the blender. The second time I made it (as soon as the first batch ran out!) I added canned chicken (I am restricted to a soft diet right now, so it’s another compromise) before blending, so it’s all smooth and delicious. I haven’t enjoyed cooking for the last several years, but this makes me feel like it might become my friend again. Thank you for making this soft diet routine seem like “restriction” to simple-prep gourmet food! Hi–The soup came out well, but it was not nearly as bright green as yours (more bland green and less appealing). Did you puree in the spinach? Would this taste okay cold? I’m looking for healthier things to pack and take with me for lunch at school. Sally-Anne – I’ve only ever enjoyed this warm but you could definitely try making it, tasting it cold and deciding whether it’s good enough to take for lunch. Good luck! It is easy and quick to make, creamy, and delicious. I never add the chicken and only some of the spinach. It might not be truly vegetarian since it is made with chicken broth. This is a terrific soup! I used sweet onion instead of leeks because I am lazy and don’t like cleaning them. Also, I had to substitute dried basil because I didn’t have any fresh, and the flavor was still wonderful. Thanks so much! I made this to the delight of my ten-year-old who thinks I should be sure to make it on St. Patrick’s day! We all were amazed by how green it is. I didn’t bother with the chicken since we love all veggie soups and this one looked like it would be yummy without the meat. I froze a bunch of zucchini before we had hard frosts kill everything so now I have some fresh grated zucchini in the freezer for both this soup and zucchini cake! What a treat that will be in the dead of winter! I just made this. Love the creamy base with no cream! Yum. For us it was way too peppery though– will cut way back next time. And I preferred it before I put the cooked chicken in, so I think we will go vegetarian next time. But overall another healthy, yummy hit! I just wish it had turned the pretty green color in your picture. My “hulk” is quite pea green, which is going to make it a harder sell with the kids! I just made this soup and it is delicious. I threw in some leftover quinoa I had in the fridge and I love the extra texture it provides. Thanks Mel!! You are my GO-TO site for my dinner time meal planning. I have followed your blog for over a year now and love it. I am always referring people to your site. I grated zuchinni just yesterday, could I use that in place of chopped zuchinni? Also could I use frozen spinach or would it be better to leave it out? This was so delicious! Thanks so much! I was wondering if this would freeze well? I made a big batch and want to freeze individual servings for my lunches. Thanks, Mel! Missy – yes, this soup freezes well! I have had most of the ingredients languishing in my fridge for a week while I looked for leeks – no such luck. I finally subbed a shallot and an onion because I had to make this soup! Also subbed veggie stock and nixed the chicken to make it vegan for a friend – she is going to love this! Thanks for introducing me to the ‘creamy’ powers of zucchini…I see many more creamy-without-cream soups in my future. Delicious soup and added some fun variety to the recipe binder – yum! Thank you Mel! My family was skeptical about the green ( teenager and husband here), but ate it all gone. One thing to note – it only made about 2 1/2 servings (or bowls) of soup without the 1-2 cups chicken. Only had to feed three people so salad and bread made for a full meal. Certainly, chicken would have added more to the pot, but needs to be doubled if you have more than 3 to feed or choose to omit the chicken. Made this and we loved it as well! I cut down the amount of pepper and still found the pepper flavor to be a bit strong, so next time I might cut in half. I never thought to use my immersion blender, though (duh!). Great suggestion, Kathy. I think I will puree the spinach too next time. You better believe there will be a next time. VERY delicious. This was so good. Next time I’m going to puree the spinach, as my little one didn’t like the “leaves” in the soup. Just another great recipe. I made this last night, and we absolutely loved it! Super easy, and so good. Thanks for a great recipe! Soooo delicious! Though I followed the recipe exactly and got like 2.5 servings. Definitely going to double or triple it next time. Too good to not have seconds! ! Blender?? You need to get yourself an immersion blender!! It’s fabulous for jobs just like this. Thanks for the fabulous recipes!! Made this last night. It was a little too spicy for my kids and hubby. I put in the amount of pepper called for but I think I must have really spicy pepper cause this seems to be happening a lot. The Hulk thing worked for my son but my daughter still would not eat it! 🙁 sure wish she would branch out. I liked it and will make it again great way to use up zucchini! Oh, I have to try this….if for no other reason than to see if my kids will eat it:-). It sounds awesome. My girls inhale kale chips so I am hoping this might have the same effect. It sounds wonderful though – I’m looking forward to it myself! If I had to eat one thing and one thing only for the rest of my life, it would be this soup. Thank you for bringing this soup into my life. It is incredible!! We had this soup tonight and it was yummy! I doubled it and it fed 2 adults and 4 children 7 and under. My boys just knew that their skin was going to turn green like the hulk. Next time I will triple the recipe. I served it with homemade wheat bread. I just made this soup. It is every bit as good as you claim and even more so. I am so much of a soup person that when my husband asks me where I want to go for our anniversary, I always pick a place that has delicious soup. And the soup is my main course. This recipe is going into my “Best Soup Recipes” file. Thanks so much for sharing! Mel, this was a 16 thumbs up meal at our house!! At first serving, I had six skeptical children and a doubtful husband thinking this might, just might, be the first time Mel had let us down. Not so!! They speedily polished off the entire triple batch, leaving nothing left over for mama’s lunch today :(. Hi Mel- I’m such a huge fan! Thanks for always delivering for us. Just wondering if this soup can be made earlier in the day or if its a better “served immediately” kind of thing! Any thoughts? Kim – yes, I definitely think this could be made ahead of time! So I really hate diet food, usually recipes have weird ingredients and frankly don’t end up tasting very good in the end. But Mel, you have posted amazing food over the last year that has helped me lose 20 pounds on weight watchers! Between the chipotle chicken skewers, and the butternut squash quinoa chicken soup, and now this, wow, it’s been amazing and made me re-look at how to do “healthy food.” I know “healthy food” isn’t your website’s goal (which is, frankly, the best part) and I would be super sad if you stopped posting recipes full of cream and butter, but if I see a recipe here that it’s good, healthy or not. BTW, if anyone cares to know, this soup, if divided into 4 servings, is 5 points a serving. That’s a pretty rocking lunch. I’m so glad there’s not a lot of basil in this. Just recently I’ve allowed myself to admit that I dislike basil nearly as much as I dislike cilantro. I’ll substitute flat-leaf parsley. Soups like this have become favorites of mine over the last year or so. I have one with broccoli in my fridge now. I also eat them with bread and fruit for a simple and nourishing meal. I’ll make this as soon as I get the ingredients. Thank you. I’ve never made anything from your site that I haven’t enjoyed…and this one takes the cake! Wow!! This soup is ridiculously good!! When I first aw the recipe I thought, “That looks tasty, but can it really be as good as she says?” YES!! It really is THAT good. It took no time to whip up! Bonus! Thanks again for a great recipe! Made this tonight – sans spinach (thought I had in the fridge but did not). It was very yummy, but, this must be doubled! The recipe is for a very small crowd. Anyway. That was rambly, but even with all the “eyeballing” going n, I still didnt mess up the recipe, and my nonsoup eating husband really enjoyed it! And so did I . This is def a keeper, cant wait to remake it for my picky MIL 😉 It will really win her over, she loves leeks and calabazas! I made this tonight and we all loved it. It surprised me how good it is. The fresh basil is a must. Delish. Mel, do you think this would work in a crockpot? 5-6 hours on low? Wow. We had this for dinner tonight and everyone enjoyed it, including the 2 & 4-year-old boys. We’ve renamed it Screaming Green Soup. This was so well liked that my husband is wondering how we might automate some sort of menu planning and have this pop up randomly throughout the year. That really is saying something, as we rarely plan meals more than two days out. Who knows, maybe this will be the recipe that inspires us to start down the path of a more organized life; it would be “life changing”. Hey Mel, I know you love leeks but unfortunately my family refuses to eat them. Do you have any other suggestions for substitutions? Thanks!! All your recipes are delicious! Another awesome way to use zucchini for creamy deliciousness…. In guacamole, mixed with the avocados, lime, cilantro, onions, s&p, garlic, tomatoes…. No sour cream! It’s really good. This soup looks great. Thanks again, Mel. Have you ever frozen this soup? Does it freeze well or is it one of the better eaten fresh types? I’ve got all the ingredients and am thinking of making a batch for when it is not 100 degrees out. Looks wonderful, I have a VERY soft spot, lol, for soup recipes, am always on the lookout for new ones, thank you , Mel! I make a much simpler one with zucchini and dill and you are so right, creamy! This does look awesome! Love the color! I just love how green this soup is. And leeks – yum. I love leeks! This is totally going on my list of must-make soups for the fall. Mine is not bright green, but I’ve got a very similar soup posted that I call “Dream” of Zucchini soup. In addition to the leeks and zucchini, I put in a medium-sized potato which all contribute to a creamy soup without any dairy involved. I’ve swapped out the zucchini for cauliflower, and it’s equally good. Looks like spinach is a great addition and I’m going to have to try it soon. Great way to get daily servings of veggies into kids! Hi mel! Im not sure why I have not commented on a recipe until now but here I go! I have been following your blog for almost two years now and have made many of your recipes which have all been fantastic by the way. I am planning to make this soup on this weeks meal plan, my husband claims to not really like pureed soup so I will let you know how it goes. Just wanted to stop by and leave you a long over due comment to say thank you for posting all of these wonderful recipes. Oh and p.s. Obviously I talk about you(your blog) more than I realize! I used to start off sentences to my husband with “you know Mel from mels kitchen cafe ….” But a few nights ago my husband inserted “yes i know Mel, you can just say Mel from now on”. Ha! I find that even my 1 kid who doesn’t like vegetables (as much as she tries!) will go for them in a smooth and creamy soup. This looks beautiful, Mel. I wouldn’t change a thing! Could you use just onion instead of leek? Hi Natalie – I have a love affair with leeks. I can’t describe how much I adore them so I definitely encourage using them. They have a delicious mild onion flavor. Having said that, you could definitely experiment with onions…just take care that the onion flavor doesn’t overpower the soup. Great idea Dessert For Two; I second the motion re the t-shirt with your blog header on it – hint, hint, Mel. Ava – yes, baby spinach would work great. Just made my shopping list for this soup; dinner tonight! All of that creamy deliciousness with no cream? That’s awesome! I am SO making this!